Remote Alaska Fly Fishing Lodge on the Hoodoo River When you think of fly fishing in Alaska, images of primal beauty take shape in your imagination punctuated by hard fighting fish too numerous to count. In those images is a sense of something pristine and untouched, where isolation and solitude allow for focus and a clearing of the mind. The Hoodoo River on the Alaska Peninsula is one of the State’s last untouched sport fishing destinations, and one of the only places where fly fishing for king salmon is suitable. 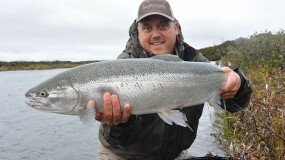 In fact, fishing at the lodge is fast and furious for kings, silvers, reds, and chums, with very few pinks in between. This is the Alaska you’ve dreamed about, and at Hoodoo Sport Fishing we combine luxury accommodations among the wilds of America’s last frontier. Our backyard is one of the most remote places on earth where you will enjoy fly fishing without the presence of any other lodges and minimal competition for prime water. Our fly fishing lodge offers something unique, it sits on privately owned land overlooking the Hoodoo River. Our fly fishing lodge is surrounded by the Alaska Peninsula National Wildlife Refuge, and the backdrop is the Alaska you’ve always conjured in your mind’s eye. Because we are the only lodge on the river it is very difficult for anyone else to travel to our location. The Backdrop of our Alaska Fly Fishing Lodge In a word, the Alaska Peninsula is primal. This is a land unspoiled by progress, where broad ranges of mountains spill out in every direction. This land is alive, and in many ways is still finding definition. Active volcanoes give way to broad valleys teeming with wildlife and crystal clear waters, and glaciers carved both the fjords and the lakes that lie further inland. The local’s name for both the river and the lake is “Hoodoo,” and the river flows 35 miles from the lake into the Bering Sea. Our Alaska fly fishing lodge is nestled into this stunning landscape approximately 10 miles from the ocean. Finding fish requires little more than a short jaunt from the backdoor of the lodge. 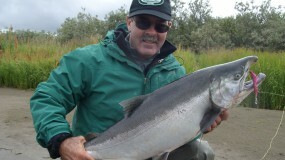 The Hoodoo River boasts incredible fishing for ocean bright Chinook (King), Sockeye (Red), and Coho (Silver) salmon. These are not lazy, spawning fish at the end of their cycle. These are hard fishing, dime-bright salmon that will challenge any angler, seasoned or novice. 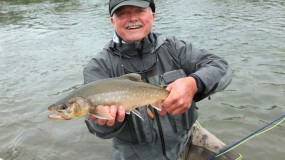 At certain times of the year there may be other species of game fish in the river, which can afford anglers the opportunity to do some fly fishing that is out of the ordinary. However, our focus is always putting you on the hardest fighting, largest fish in the river, so that you can get a real taste of what real remote fishing is like. About the Hoodoo Lodge Our Alaska fly fishing lodge sits on a riverbank that overlooks the flowing waters of the Hoodoo River. The landscape in this place is spectacular, and truly remote. Located on the extreme northwestern tip of the Aleutian Peninsula, our private parcel of land guarantees that you will experience some of the finest, most exclusive fly fishing in the entire state. Our fly fishing lodge boasts all of the comfort and amenities you should expect from deluxe accommodations, and we consider it one of our top priorities to ensure all of your needs are tended to. We designed our fly fishing lodge with comfort in mind, with daily cleaning service, hot and cold running water, a laundry room, and the ability to control your own room’s thermostat. Our staff will customize their service to suit your individual needs, so you can be sure that your stay will exceed your expectations. 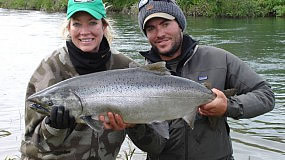 Our Equipment and Guides are of the Finest Quality Even traveling to our Alaska fly fishing lodge is an incredible experience that you will not soon forget. You will fly in our DeHaviland Beaver, piloted by your host Rod Schuh, and landing on our own private airstrip. As you fly over this primitive landscape you will likely see herds of caribou and mighty Alaska brown bear, untouched until you reach Hoodoo Lodge. We use custom built aluminum jet boats that are perfect for shallow water, while offering comfort and speed for accessing prime locations. We also ensure that our fly fishing equipment is of the highest quality, so that you can concentrate on the task at hand. From waders to rods and reels, we will supplement the equipment you bring to make your fishing adventure a success. We are eager to share our experience to optimize your success. We are more than happy to provide you with both conventional and fly gear, but if you are serious fly fisherman, we recommend you bring your favorite rod along for the journey. Finally, our guides will ensure that you have the experience of a lifetime and will go out of their way to provide you with everything you need to make your outings enjoyable. Browse our website and find the right fly fishing package for you. We offer an experience in Alaska like no other, and we are eager to share our love of this place with you and your closest friends and family.